The Theatre School at DePaul will break ground June 1 for a new home – a 175,000 sq. ft. multipurpose facility designed by internationally renowned architectural firm Pelli Clarke Pelli. Founded by Cesar Pelli, former dean of the Yale University School of Architecture, Pelli Clarke Pelli has designed some of the world’s most recognizable buildings, including the Petronas Towers in Malaysia, the World Financial Center in New York and the International Finance Centre in Hong Kong. The firm has a strong portfolio of performing arts centers affiliated with universities, including those at Vassar College, Grinnell College and the University of Minnesota. Pelli Clarke Pelli was one of seven firms asked to submit designs for the building. As yet unnamed and with a tentative price tag of $69 million, the airy, five-story building is designed to showcase the varied and dynamic activities that characterize the school, its students and faculty. It will house a 250-seat theatre, a flexible 100-seat black-box theatre as well as administrative and faculty offices, classrooms, rehearsal spaces, design studios, workshops and the school’s script library. The flexible theatre will be named for longtime DePaul supporters Sondra Healy (a 1964 alumna of the Goodman School) and her husband, Denis. The structure will be located on the southwest corner of West Fullerton and North Racine avenues, and serve as the western gateway to the university’s Lincoln Park Campus. 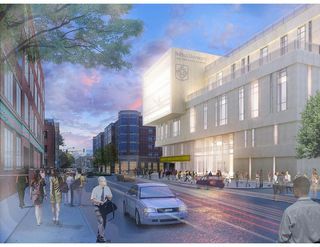 DePaul announced its intention to build a new Theatre School facility – as well as new and renovated facilities for its School of Music – in fall 2009. Funds for the buildings’ construction will be raised in part through the Many Dreams, One Mission Campaign for DePaul University, a $250 million effort which was announced in spring 2010. DePaul’s theatre and music schools both are ranked among the country’s top conservatory-style programs in their respective disciplines, despite having been housed in inadequate facilities for decades. According to John Culbert, dean of The Theatre School at DePaul University, the new facilities were specifically designed to support, engage and share the work of theatre artists with the DePaul community, the Lincoln Park community and the city of Chicago. “The people in our audiences are not just spectators,” he said. “They become part of the training process for actors, designers, stage managers, directors – everyone who is part the performance.” He adds that the idea of engaging the audience in such a way is facilitated by the building’s design. Many of those inner workings will be visible from the street too, he continues, noting that pedestrians will have clear views into the scene-building, painting and other usually “behind-the-scenes” workshops that make every theatrical performance tick. DePaul’s new music school complex will be constructed along the west side of North Halsted Street between Fullerton and Belden avenues. A new Music Center building will anchor the complex, housing the 550-seat William E. Hay and Mary Pat Gannon Hay Concert Hall, a large 150-seat recital hall and a smaller 80-seat recital hall. The current music administration building will be substantially renovated and will continue to serve as the school’s administrative hub, housing offices, classrooms and teaching studios on its existing three levels. The Chapel, current used as the concert hall, will be substantially renovated to accommodate an opera hall. The largest fundraising effort in DePaul’s history, the Many Dreams, One Mission Campaign seeks $100 million in new scholarships as well as an additional $150 million for facilities, faculty and programs. The Campaign, which has already raised some $200 million, is expected to conclude in June 2014. With an enrollment of more than 25,000 students on two Chicago and four suburban campuses, DePaul is the largest Catholic university in the nation and the largest private, nonprofit university in the Midwest. DePaul is an innovative and diverse university offering pragmatic educational programs that instill values, including a commitment to community service. Learn more about the university at www.depaul.edu and more about giving to DePaul at www.giving.depaul.edu. The Theatre School at DePaul University educates, trains and inspires students of theatre in a conservatory setting that is rigorous, disciplined, culturally diverse and that strives for the highest level of professional skill and artistry. A commitment to diversity and equality in education is central to our mission. As an integral part of the training, The Theatre School produces public programs and performances from a wide repertoire of classic, contemporary and original plays that challenge, entertain and stimulate the imagination. We seek to enhance the intellectual and cultural life of our university community, our city and the profession. You are currently browsing the DePaul Advancement News blog archives for June, 2011.